I think the best way to know your local beer scene has exploded is to have breweries move from other Provinces or States to your home town. 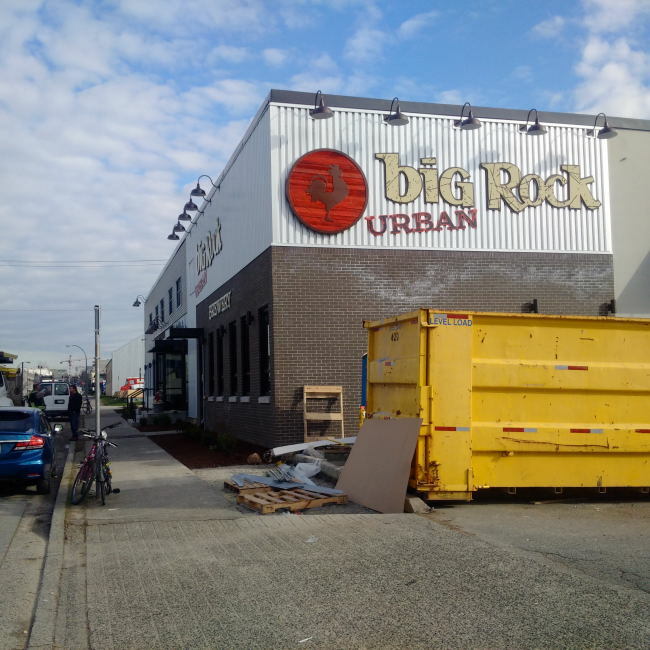 Well known brewery Big Rock from Alberta is about to open Big Rock Urban Brewery in Vancouver. Not only will this be a production brewery but it will also be an Eatery, retail location and an on site distribution centre. The Eatery potion of the brewery has a slight barn feeling to keep with the Alberta feel but also brings in many Vancouver Urban notes to make a great looking space. The bar area even has a Cask Engine! They plan on having an extensive cask program on site. One very nice touch with the Eatery is they have a stage for live music! We seem to loose small local stages every year in Vancouver so its good to see that they want to support the local arts community! They have built the brewery with a very open concept at this location. At the back of the Eatery there are a bank of windows. Through these windows you can see the entire brewery and even their lab to the far side. One thing that is very obvious is that there is a huge amount of space for expansion of this brewery. When it comes down to it they could even expand into the distribution area and do that portion of the business off site in the future! I did not get a great view of the retail space as I showed up at the brewery unannounced. 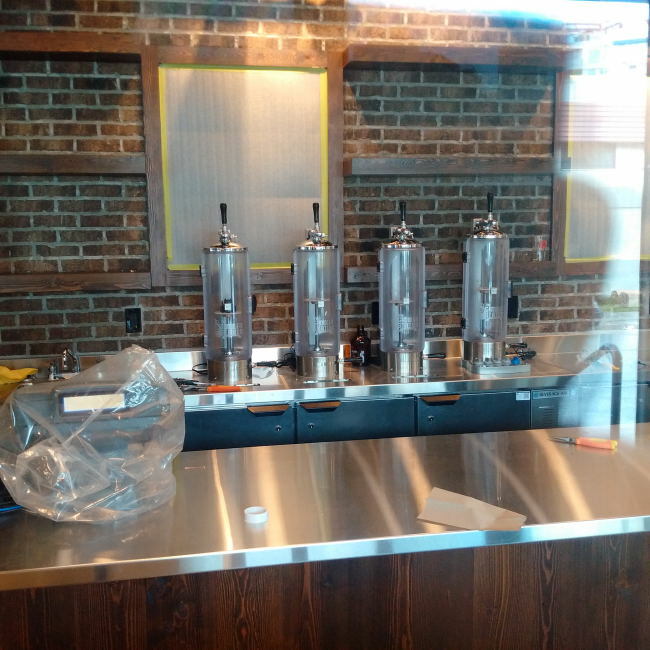 Currently they have a big space with 4 Growler filling stations as well as a big bank of coolers for packaged beer and bombers. I am sure they will also have the space full of all kinds of brewery swag. With construction still underway the staff is furiously dusting the entire Eatery trying to keep it in tip to shape as the opening day is really not that far off. From my discussions with Brewery staff at Whistler Village Beer Festival the beer brewed in Vancouver wont just be their Alberta recipes but beer brewed in the West Coast tradition. I know I am always excited to have a brand new brewpub in Vancouver and I look forward to seeing what they have in store for us from the Brewery and the kitchen! This entry was posted in Brewery and tagged beer, big rock brewery, big rock urban brewery, brewery, brewhouse, brewpub, craft beer, distribution, mount pleasant, vancouver. I am actually surprised they have not opened yet. It is coming very soon from what I had been told.